Click on above image to launch iTunes & subscribe. 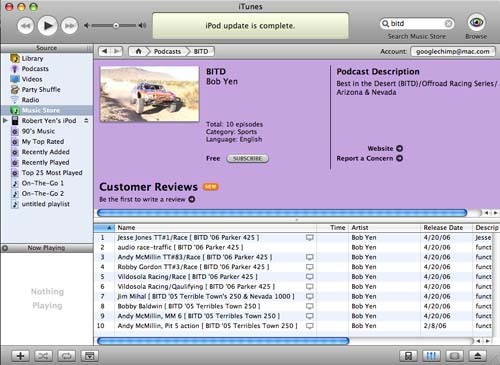 Vegas to Reno updates (video & audio race-traffic) will also be available as a "video podcast" over Apple's (video-capable) iPod/iTunes. 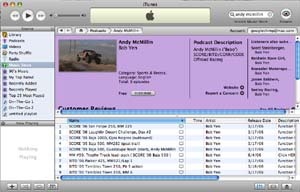 Just download iTunes (see http://www.apple.com), open up iTunes, goto Music Store..do a search on "BITD" (or "Casey Folks", "offroad racing", "McMillin Racing", etc). 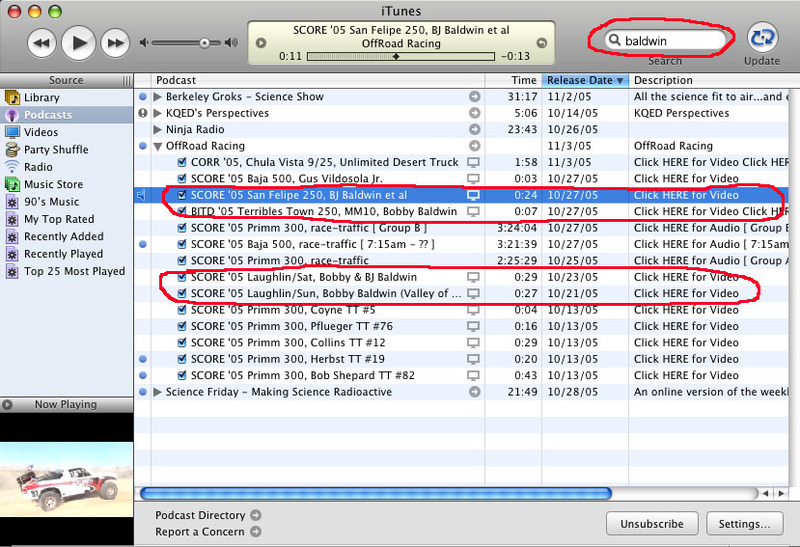 Then, select the "BITD" podcast, & subscribe to it. 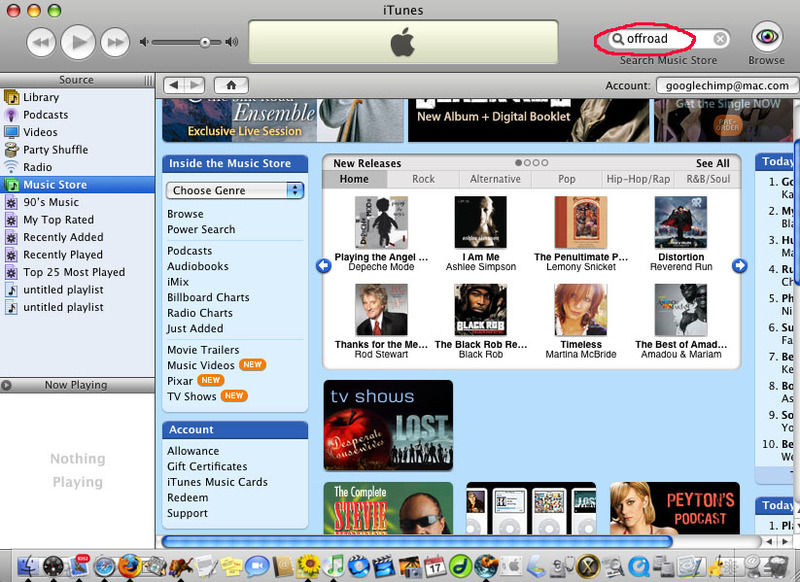 Goto "Podcast" section, & play the selections. 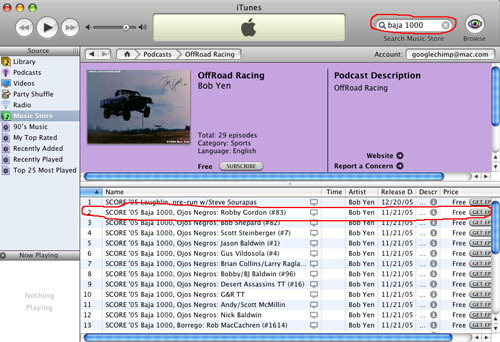 Or, download to iPod..carry around & show it to friends/sponsors: "This is Offroad Racing". 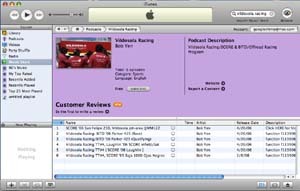 Click on left (or here) to goto "Vildosola Racing" video-podcast, for a collection of video clips. It is a syndication (using a special RSS feed) of the "Vildosola Racing" video-blog at http://vildosolaracing.blogspot.com. Click on left (or here) to goto "Terrible Herbst Motorsports" video-podcast, for a collection of video clips. It is a syndication (using a special RSS feed) of the "Terrible Herbst Motorsports" video-blog at http://terribleherbstmotorsports.blogspot.com. 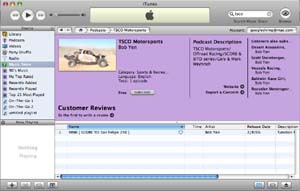 Click on left (or here) to goto "TSCO Motorsports" video-podcast, for a collection of video clips. It is a syndication (using a special RSS feed) of the "TSCO Motorsports" video-blog at http://tscomotorsports.blogspot.com. Click on left (or here) to goto "Jones Motorsports" video-podcast, for a collection of video clips. 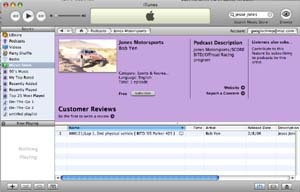 It is a syndication (using a special RSS feed) of the "Jones Motorsports" video-blog at http://jonesmotorsports.blogspot.com/. 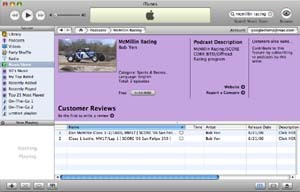 Click on left (or here) to goto "McMillin Racing" video-podcast, for a collection of video clips. It is a syndication (using a special RSS feed) of the "McMillin Racing" video-blog at http://mcmillinrace.blogspot.com/. Click on left (or here) to goto "Andy McMillin Racing" video-podcast, for a collection of video clips. It is a syndication (using a special RSS feed) of the "Andy McMillin Racing" video-blog at http://andymcmillinracing.blogspot.com. 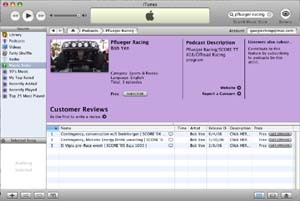 Click on left (or here) to goto "Pflueger Racing" video-podcast, for a collection of video clips. It is a syndication (using a special RSS feed) of the "Pflueger Racing" video-blog at http://pfluegerracing.blogspot.com.